Kalaheo's Cody vonAppen reached for the end zone but came up short on a fourth-down play last night. The heavyweight champion, Kahuku, took all the punishment Kalaheo could dish out. It still wasn't enough to knock out the champ as No. 3-ranked Kahuku rallied for a 33-26 win over 10th-ranked Kalaheo last night before 4,000 at Carleton Weimer Field. The Red Raiders picked up their first win of the year after losses to Saint Louis and Utah state champion Bingham. "This was very important coming off those two losses," linebacker Paipai Falemalu said. The 6-foot-4, 215-pound senior proved to be a big playmaker during a pivotal stretch. He came up with a diving touchdown catch in the third quarter, and followed that with a key fumble recovery that helped give Kahuku a 16-point lead. The Red Raiders overcame a 249-yard passing performance by Kalaheo senior Cody vonAppen, who threw for two touchdowns without a pick and ran for another score. He rushed for 51 hard-earned yards on 18 carries, subjecting himself to Kahuku's savage defenders to the very end. Kalaheo fell to 1-1 in league play (3-1 overall). "Kahuku keeps bringing a body on you. They're really structured and don't fall for much. They really kept their containment on our option," vonAppen said. Kalaheo ran 34 times for just 102 yards, as Alema Tachibana and Shiloah Te'o led a swarming Red Raider defense. Kalaheo finished with 351 total yards and led early, but never regained the lead in the second half as Kahuku's ground attack overwhelmed the Mustang defense -- a unit filled with two-way players. Junior Mataafa led Kahuku with 150 rushing yards on 13 attempts. St. John Lessary added 106 yards and two touchdowns on nine carries. Behind the mammoth line of Daniel Kinikini, Patrick Au, Jordan Bridges, Anthony Siilata and Samiu Tonga, Kahuku racked up 364 rushing yards on 38 attempts. After coming up short at Kahuku's 2-yard line early, Kalaheo got on the scoreboard with Nathan Johnson's 24-yard field goal with 26 seconds left in the opening quarter. The Mustangs recovered the ensuing onside kick, and vonAppen hit Larry Soto for a 28-yard pass and later finished off the drive with an 11-yard loft to Bruce Andrews in the end zone for a 10-0 lead with 10:46 to go in the second quarter. Once again, Kalaheo recovered the on-side kick, but the drive sputtered at the Kahuku 41-yard line. Kahuku's offensive line, barely on the field at this point, began to dominate. In just five plays, all on the ground, the Red Raiders drove 59 yards. Lessary's 33-yard jaunt off left tackle brought Kahuku within 10-7 with 7:26 to go in the first half. Late in the half, Kahuku drove to paydirt in eight plays. Jray Galeai's keeper from the 1-yard line gave the Red Raiders their first lead, 14-10, with 31 seconds remaining in the half. Kahuku amassed 212 rushing yards on just 15 carries, including 131 yards by Mataafa, by intermission. The Red Raiders took command with a 15-play, 63-yard drive. On fourth and 2 from just outside the 2-yard line, Galeai rolled left and threw to Falemalu, whose sliding catch in the end zone ended a 6-minute, 21-second march. The PAT was blocked by Keano Bruhn, but Kahuku led 20-10 with 11:54 left in the game. 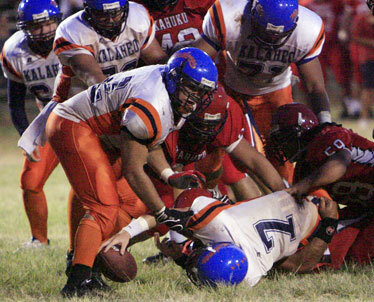 Moments later, Falemalu recovered a fumble at the Kalaheo 24-yard line after Te'o stripped the ball from vonAppen. Three plays later, Siilata and Tonga opened a wide hole for Lessary, who scored easily on a 19-yard touchdown run for a 26-10 Kahuku lead with 9:32 to go. Kalaheo bounced back with a 13-play, 76-yard drive. A 30-yard pass from vonAppen to Andrews gave the Mustangs momentum, and vonAppen scored on a 1-yard keeper. The quarterback connected with Andrews on a 2-point conversion to bring Kalaheo within 26-18 with 4:29 left. However, the Mustangs' on-side magic evaporated. With their hands team on the field, Te'o recovered the on-side attempt, and A.J. Atuaia scored on a 3-yard run to push Kahuku ahead 33-18 with 3:20 to go. Kalaheo then drove 73 yards in nine plays for another score. VonAppen found Kao Malama-Custer leaking off pass protection for a completion, and the senior scored on a 22-yard touchdown. That brought the Mustangs within 33-26 with 59 seconds left, but Kahuku's Kulia Pickard recovered the final on-side attempt and the Red Raiders breathed a sigh of relief as time finally expired.